You realise how youthful, in some ways, the South African wine industry is when Meerendal can claim to be “one of only a handful of brands in South Africa with the proud tradition of 50 years since the bottling of its first vintage in 1969 selling wines uninterruptedly in the local and international markets”. Some vines had been planted on the farm in the 18th century, but (like most of the Durbanville farmlands) it was all under wheat when new owner William Starke planted shiraz in the early 1930s. 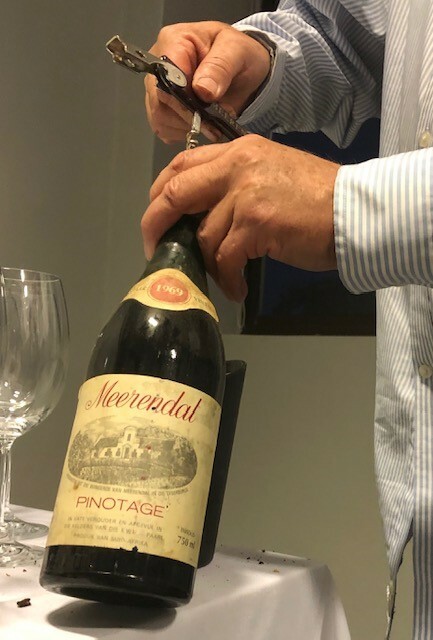 Pinotage was planted in a big way in the 1950s – including, in 1955, the six hectares of bushvines that now provide grapes for the Meerendal Heritage Block Pinotage – the bottles bearing the Old Vines Project Heritage seal. It’s the oldest extant vineyard in Durbanville and one of the oldest pinotage blocks in the country. At a celebration held at the estate this past week to mark the 50 years since the first bottlings under the estate name, we visited the vineyard. It looked a trifle weary and depressed, of course, at this time of year, post-harvest and showing its heavy load of virus, but Liza Goodwin – who makes the wine still in traditional old concrete kuipe before putting it into oak – says that it remains vigorous and still bears well. There are processes underway to clean up material from some of the best vines and make it available for replacing dead vines in the vineyard, and for new plantings – all with “the original pinotage DNA”, as marketing manager and industry stalwart Bennie Howard put it. Up till 1969, all the wine went off to nameless vats at the KWV, but from that year some were bottled under the estate name. Shiraz also made a debut in 1969, but the focus of the celebration tasting was 50 years of pinotage. (Unfortunately, I have to confess having lost my notes and must rely on memory in reporting on it.) That maiden 1969 was very much alive still, had swallowed its presumably once substantial tannins, and showed well, with some rather pinot-noiresque notes and a touch of piney greenness (not at all unpleasant) that was, in fact, discernible in all the old wines. The 1974 was the first made under a new partnership with the Bergkelder, which matured, bottled and marketed the wines (previously the own-label wines were only available to KWV members). This was a generally fine vintage, and this Pinotage showed well, even quite youthfully fruity, but with a touch of sweetness. The 1978, though, was generally reckoned the star of the evening, as it certainly was for me: still fresh, finely balanced in terms of tannins, acid and fruit depth, with a perfumed elegance that recalled the wine’s pinot noir parentage. Then came quite a jump, to 1996 (not usually regarded as a good vintage in the Cape). There was apparently substantial bottle variation and unfortunately, I was on the wrong side of the room. I noticed that sommelier-at-large Higgo Jacobs, on the correct side, appreciated it greatly, but our bottle seemed a bit grubby and at odds with itself, though not obviously oxidised. And so definitively to modern times, and to the 2005 – made from 50-year-old vines, and the first to be called Heritage Block Pinotage. Fairly big (at around 14% alcohol) and coming across assertively and boldly, with notable new oak and with a finishing sweetness, it was undoubtedly impressive and very much still alive, but of a style which the older, more elegant wines on the tasting reproached. It might, I suppose, last as long as the 1970s wines, but didn’t show signs of developing as interestingly, let alone with the grace of the 1978. Unfortunately we didn’t have a more recent bottling than 2005, but I remember being more taken with the one shown at the launch of the Certified Heritage Vineyard seal last year (2015, probably). Representing current production of pinotage was a new wine being launched that night: The Pinotage Vine. Although it was vintaged as 2016, it came very close to completing the representation of a half-century of bottling pinotage at Meerendal. For, after nearly a year in barrel, 2016 wine was put on the fresh, sweet skins of the 2018 Heritage block grapes (with permission from the authorities! ), and a small element of refermentation occurred. The wine then spent a further seven months in barrels before bottling. It’s very attractive, with some freshness, engaging dark fruit flavours and no excess of oaky ones, and firm but quite easygoing tannins; a touch drier in effect than the 2005. Wine of Origin Cape Town – the new appellation has been eagerly adopted by Meerendal, sadly thus losing the declared historical connection to Durbanville, in the name of sexier marketing I suppose. When asked about the price of the new wine, the Meerendal team seemed nonplussed, but eventually came up with “about R250”. As it’s on sale now, presumably they’ve definitively decided. Next articleWin a mixed case of alternative variety wines! I’ve now tasted The Pinotage Vine 2016: Some floral fragrance to go with macerated cherries on the nose. The palate is sweet in a good sense with nice depth of fruit and luxuriously smooth tannins. Rating: 88/100.